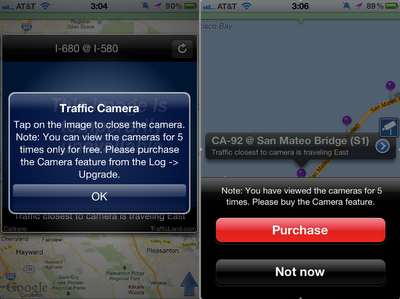 - Traffic cameras for a large number of cities worldwide. 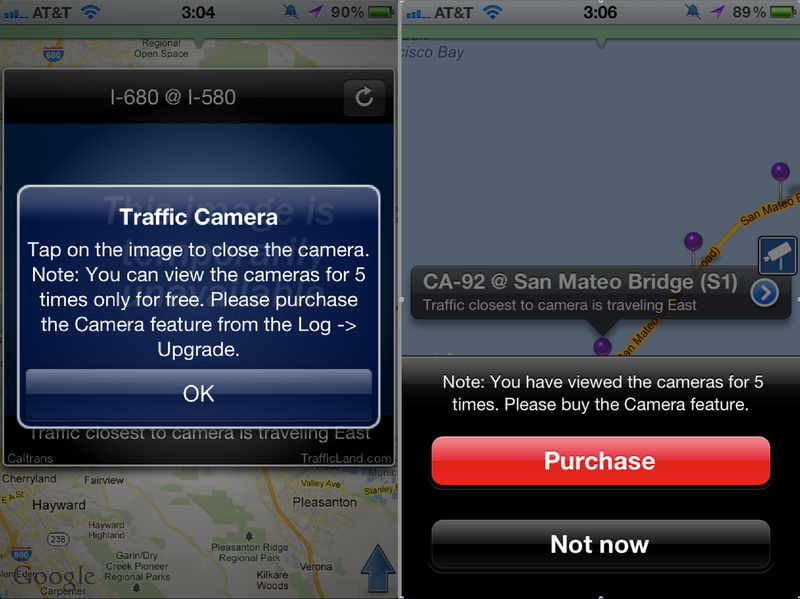 App allows to view the cameras for 5 times for free. After that users need to buy yearly subscription. - Reports: Removal of currency & distance symbols from data entries. - Improved saving of trips. 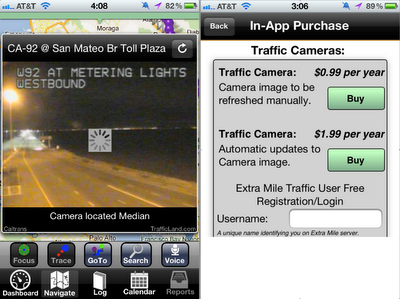 So how much does the traffic camera add-on cost? Well, it's $0.99 a year for camera images which have to be refreshed manually (by clicking the refresh icon) or $1.99 a year for automatic updates to camera images. With the second option, camera images update every 1-2 seconds but don't expect it to look like a video because between updates the refresh wheel shows up which sometimes spins for more that just a short while (only a minor gripe). The refresh wheel can spin for a while sometimes & Yearly subscriptions are inexpensive. Another issue I've found was when I tried to zoom out and pan to a different location of the map with traffic camera locations showing it kept repositioning the map back to my location. Pinch out to zoom didn't work really well and the best way to zoom out was the two-finger tap. 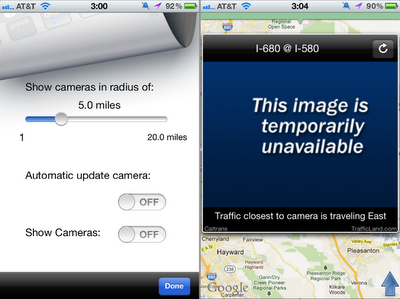 Also, traffic camera information can be viewed for cameras only within a 20 mile radius of your current location. And, not all cameras are always available. Here's the good part. 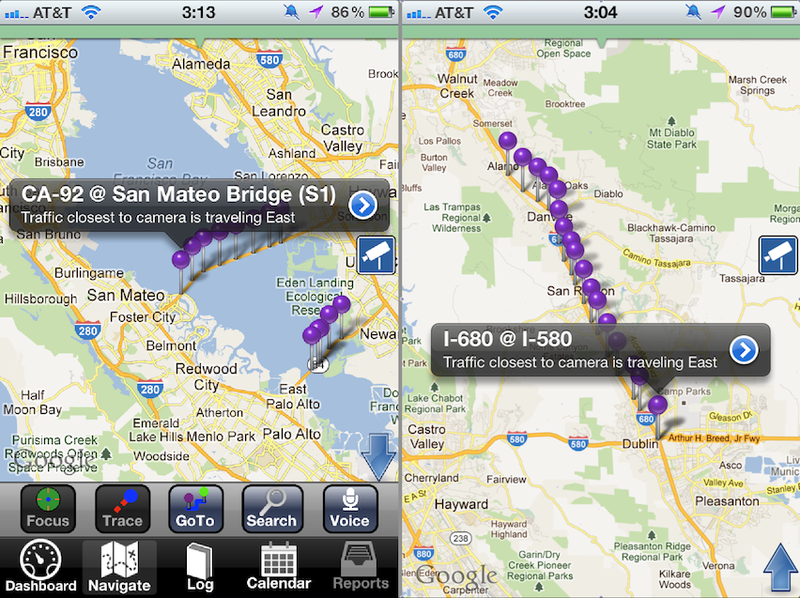 There are plenty of cameras that show up on the map (at least here in the San Francisco Bay Area). 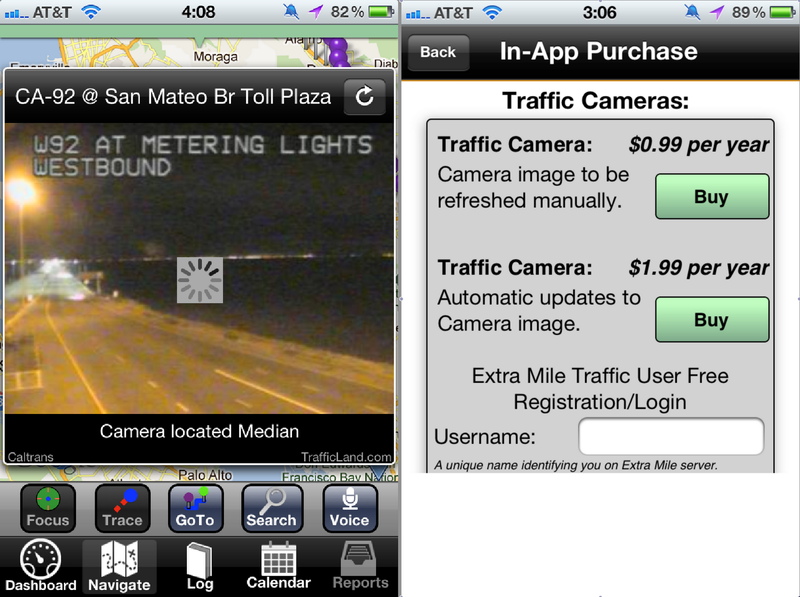 Personally, $1.99 for a year of automatically updating traffic camera images isn't much to pay. I like Extra Mile a lot and use it very often. Those live images are more useful and reliable than the red or green traffic lines on the map. Traffic sensors aren't always accurate, images are. But then again there aren't cameras everywhere unlike those sensors. I also noticed a free voice available for download for navigation. I'm not sure if this was made available with this update. I've recommended Extra Mile before and recommend this update too. If you're like me who likes to avoid congested roads (who doesn't!) than the traffic camera feature will be a welcome addition to an already awesome app. And go ahead and spend the $2 for the yearly subscription. That's less than 17 cents a month. It's worth it! Grab the update from the iOS store today. AppRadio screenshots coming soon. Stay tuned! It's a good thing there are now mobile apps available for us who doesn't have a GPS in our car.